Paul Meyer, habitually cheerful chap, had stopped by to bid me farewell. I knew Paul from church, a casual friend—until that day. I learned Paul shared my passion for the great outdoors. He was bursting with excitement as he envisioned what my life in Alaska might be like. At the peak of animated chatter, Paul excused himself, went to his truck and came back with an old handmade leather rifle case. Then he reverently unsheathed a Belgium Browning .30-06. His eyes gleamed as he handed over the fine rifle. He told me all about the treasured firearm, and his joyful gaze finally turned up from the well-oiled rifle to me. Following a moment of silence, he told me to take it to Alaska, a parting gift, if you will. 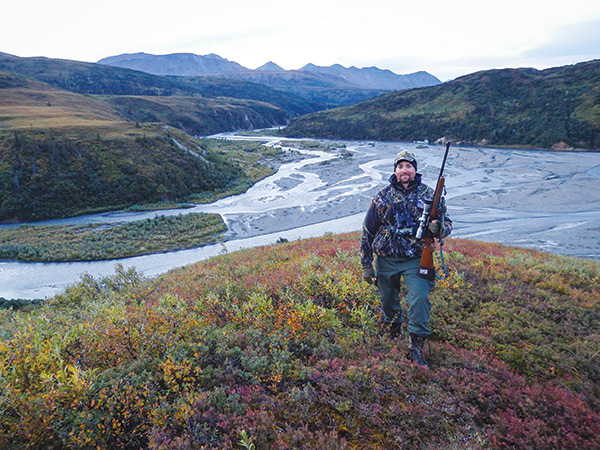 I stood there dumbfounded, and Paul explained that he had been fighting cancer for some time, that he probably would not be around for too many more hunting seasons, probably never get to Alaska to fulfill his own dreams. We exchanged a gorilla-grip handshake after that, and I carefully packed the cherished gift in the cab of the truck. The next morning I hit the road—north, to Alaska! Fast-forward four years to July, 2015. During a phone conversation with my mom, I learned that Paul had passed away, having fought the good fight ever since that memorable day in my garage. Sadly, I realized that I had only fired the Browning a few times at the range, certainly not what Paul had in mind for his beloved Belgium. Contrary to what family and friends in the lower 48 imagined, I was not spending every waking moment in the wilderness, mixing it up with grizzly bears and the like. I owned and operated a guide service, but that left precious little time for my own pursuits during hunting season. You don’t go on hunting trips in the Great Land, you embark on wilderness expeditions. I vowed to do right by Paul, and the next month I took time from work for the sort of adventure I’m sure he had in mind. 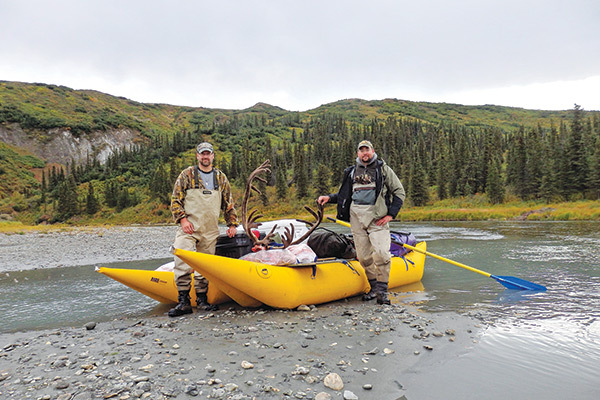 My buddy Clint Adler and I departed on a caribou float on a 30-mile stretch of the Delta River. Before leaving, I taped a picture of Paul to the stock of the rifle. We launched at Tangle Lakes on a raw and rainy morning. The first leg of the float was open water, and we covered quite a few miles that day, passing through a shroud of mist and cold, dense fog. When the clouds finally lifted, we saw a number of caribou on the move and decided to set up camp in a fantastic spot surrounded by mountain vistas. But a couple of days of exploring and thorough glassing turned up only cow and calf caribou. We saw a lone bull moose on a distant slope. We broke camp, packed the raft and headed off on the next leg of our adventure. That day proved exhausting as we had to portage the raft and all of our gear up and over several hills in order to get around a deadly set of waterfalls. We completed the portage by late afternoon and finally got back on the river, which was no longer a gentle float. The section of the Delta below the falls is white water that requires some serious rafting. As afternoon turned into evening the wind kicked up, which made the paddling a muscle-burning tag-team effort. Again, there was not much wildlife along the way, though we did experience an up-close and thankfully uneventful encounter with a sow grizzly and three half-grown cubs. With daylight fading fast, we decided to get serious about finding a camping spot. The decision became much easier upon spotting a magnificent caribou bull heading up a nearby mountain pass. As the king of the Delta crested the top and disappeared from sight, we hurriedly beached the raft and then quickly set up camp, enjoyed a well-earned meal, and were soon asleep. The next few days were again spent exploring and glassing from various vantage points. And, once more, not much was seen. The herds of roaming caribou remained in my nightly dreams. It can be truly amazing how animals simply disappear in the vast expanse of Alaskan wilderness. While luck helps, one has to hunt hard to be successful. As Clint tells it, my eyes about popped out of my head. I must admit, things were not looking hopeful up to that point. I crept over to where Clint was perched and he pointed out the bull, a magnificent lone caribou a couple of ridges over. Upon closer inspection, we agreed it was the same hulk we had spotted the evening we set up camp. We also realized it was probably going to be our only chance to fill a tag. We strapped on enormous packs and started double-timing it. The caribou was not moving fast, but nonetheless, it was moving away at a steady pace and had quite a head start. We pursued as best we could, making every effort to stay low and out of sight just below the ridgeline of the bull’s travel route. We lit into high gear and raced across the spongy, tundra. With lungs burning, sweat pouring, and hearts pounding, we caught up to where we last had seen the big bull and peeked over the ridge. He was already gone, already over the next ridge. Again, we stayed low and bolted in the assumed direction. Upon cresting the next ridge, we saw him disappear over yet another ridge. The quest continued in the same manner until, at last, we caught up. As Clint and I cautiously peeked over that final ridge, we were elated to see an enormous set of velvet antlers moving through the brush just below us. The moment of truth had arrived. Being that this would be my first Alaskan bull caribou, Clint let me move forward and take the shot while he remained behind, working the glass. I took a brief moment to mentally prepare. Then I crouched and snuck in closer, carefully creeping around the edge of the ridge top. There he stood, 100 yards out in the open. With heart pounding and lungs heaving from the pursuit, I got down on one shaky knee, rested a trembling elbow on that knee, and took fast but careful aim with Paul’s rifle. Just as I got the chest centered in the crosshairs, the caribou spotted me. Without further delay, I gently squeezed the trigger. Paul’s rifle delivered a clean heart shot, followed up with a spine-severing shot to the base of the neck that planted the massive beast in the tundra. A big chunk of hide and meat had been ripped from his hamstring area—telltale sign of a pursuing wolf pack. No doubt, the pack would have been back, and with the mighty king of the Delta all alone and in a weakened state, well, we were happy we were able to spare him that end. Needless to say, field dressing and packing out the huge beast was another heck of a workout. The next morning, after breaking camp, packing up the meat and securing the raft, we hit the river hoping for a pleasant victory float. Instead, we received yet another slap from mother nature. A windstorm kicked up shortly after we started paddling, with gusts so fierce we were being pushed backwards despite paddling with all our might. Finally, we both got out and pulled the raft like a pair of Missouri mules. What should have taken a couple of hours ended up taking the better part of the day. But such things are to be expected on an Alaska expedition. We fed on that caribou for a year, and with every meal, I thought of Paul. I now admire the massive rack in a place of honor in my home, always reminded of the rifle that Paul gave me, grateful to have been allowed to honor such a gift. I like to think that Paul was, indeed, with us on that mountain, and that the hunt was everything he hoped it would be. I plan to carry Paul’s rifle every season in the years to come, with that fading photo of his smiling face still taped to the stock.